Gripsweat - Rockabilly Promo 45/ Catalinas "Speechless" Hear! 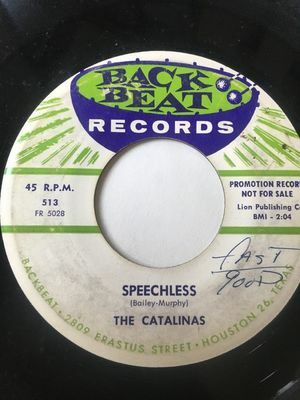 Rockabilly Promo 45/ Catalinas "Speechless" Hear! Catalinas on Back Beat 513. "Speechless" and "Flying Formation With You". The vinyl is in VG condition. There is light writing on both sides of the label. Please click below to hear actual sound clip of record.